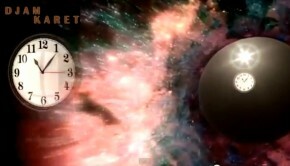 The Trip. This time out we are presented with seven distinct and separate compositions that take the listener on a…err…trip through a laid back soundscape. 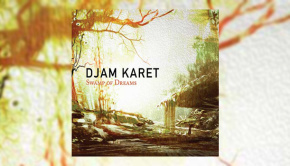 I’ll admit to not having heard all 16 of Djam Karet’s previous albums, so it may not be a first, but it was certainly a surprise for this listener to hear the fusion vibes of opening track Prince Of The Inland Empire. Bass guitarist Henry Osborne leads the way with his fast paced and fluid runs, over which jazzy keyboard runs and guitar lines stroll languidly in the southern Californian sun. The jazzy vibe is, if anything even more pronounced on Living In The Future Past, the interaction of Henry’s bass and Gayle Ellett’s Fender Rhodes being reminiscent of the more fusion inclined elements in the playing of Adam Holzman and Nick Beggs in Steven Wilson’s band. 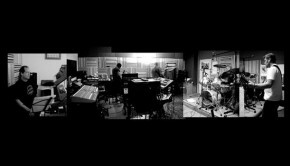 Founder members Gayle Ellett (guitar, keyboards), Mike Henderson (guitar), Henry Osborne (bass) and Chuck Oken Jnr (drums) interact with the easy grace you would expect of musicians who have been playing together for three decades. The influence of Floyd is certainly there, albeit with a very slightly funkier feel, as the second part of Desert Varnish shows. The only member of the band not there at the beginning is guitarist Mike Murray, who has been with the group since 2010’s The Heavy Soul Sessions. Mike is certainly no slouch judging by his work on Desert Varnish. I can tell it is Mike, because helpfully the sleeve notes tell us that the guitar solos are “Ellett-left speaker, Murray-center, Henderson-right speaker”. 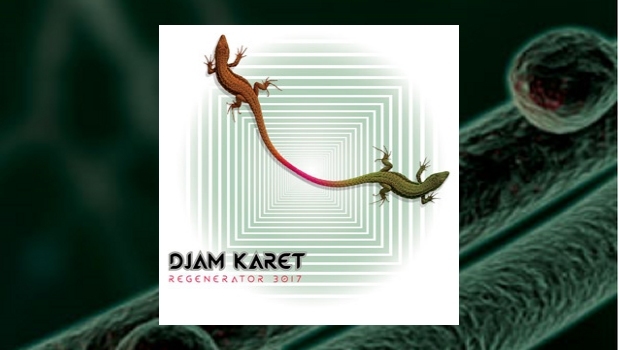 Guitar excursions have always been the mainstay of Djam Karet, and Regenerator 3017 does not disappoint in that respect. A vibe akin to Welsh Connection period Man shines through the next track, and Wind Pillow gently buffets and cossets us in our sailboat, slowly wending its way just off the West Coast shoreline, all with a nonchalant air that allows this listener to forget the woes of the day. The laid back vibe continues and Lost Dreams is the most Floydian of all the tracks on the album, but retains enough individuality to be more than merely copyist. Vintage analogue synth lines appear on this track in between the Gilmouresque guitar solos from Mike, and the deliberate harking back to the Golden Age is for once respectful but not slavishly copyist, a trait all too common with a lot of what I like to term retro-prog. Empty House is as contemplative and as melancholic the title suggests, a mini symphony of lost memories and tangible regret. Hints of West Coast psychedelia light up On The Edge Of The Moon, courtesy of Gayle’s piano, which combined with some more “Henderson-right speaker” and “Murray-center” guitar work makes for a classy end to the album. Regenerator 3017 has little of the harder edge of some of the band’s prior albums, so in this particular instance the Crimson comparison I made earlier can be discarded. Hey, we can’t be right all the time, and if you listened to the streaming as a result of my throwaway intro at the time, then it had the desired effect! The recording is of the highest quality, and a fair few modern bands could learn a thing or two from the resulting warm analogue sound, transferred to CD with NO COMPRESSION (my capitals). This essentially means you can turn it up on a decent hi-fi without the wince inducing distortion of that modern recording con trick, aimed at the far too easy-to-please mp3 generation and their retrogressive audio reproduction equipment. Yes, I’m an old fogey, and proud of it! 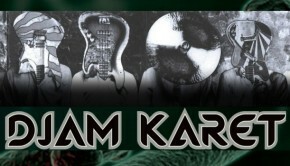 I must admit I prefer the harder edge of Djam Karet’s ouvre, as perfectly illustrated on 2010’s The Heavy Soul Sessions album, but then I always inclined towards Crimson over Floyd. However, like a fine wine, this band have matured with age, and Regenerator 3017, while not threatening to break down any doors is an assuredly classy album, and one that has no need at all to brag or make bold claims, for it is comfortably and perfectly at ease with itself.